A detail look at a Kassel kerb. Note the rounded section which allows the tyre to ride up and realign itself. A bus stop kerb is a special kerb (curb in US English) designed for low-floor buses that serve an elevated bus stop platform. The usage spread after good experiences with the Kassel kerb featuring a concave-section that allows for an easier alignment for buses which was first introduced in the German city of Kassel. 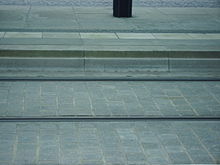 The invention of special curbs for low-floor buses is connected with the introduction of low-floor buses and modern low-floor trams in the late 20th century. The German NEOPLAN Bus GmbH had designed the first bus with a "low-entry section" in 1976 but it was not accepted well in the market. Since the 1980s, the Association of German Transport Companies invested into the design for a new standard bus, the "Standard-Linienbus II", with the second-generation Neoplan N 416 from 1982 to find wider acceptance. Shortly later, MAN's competitor Daimler was designing the Mercedes-Benz O405 in 1984 to fit with the new Standard-Bus requirements, and this model spread quickly in the market in the late 1980s. Based on the Standard-Bus model, a number of variants were developed by their respective manufacturers - here, it was the Kässbohrer Setra S 300 NC to show the first a low-floor version in 1987 that was sold since 1989. Daimler began to derive the low-floor version of its successful model in its Mercedes-Benz O 405 N, that was produced since late 1989, and which proved to be of a robust design in the following years, leading into rising production numbers. Consequently, Neoplan again developed low-floor versions of their Standard-Buses, named Neoplan N4014, N4015, N4016 NF with production starting in 1990. With more low-floor buses being introduced to public transport in Germany in the late 1980s, it sparked ideas to optimize accessibility. The introduction of low-floor buses had reduced the number of steps from two or three to one, but the remaining step was a barrier to wheelchairs. A simple elevation of the bus platform is not enough, as there is often a gap too wide for wheels to traverse. The parallel introduction of low-floor trams showed, that with proper horizontal alignment, the gap can be small enough to be barrier-free. The introduction of barrier-free concepts into bus transport systems in the 1990s was successful up to the point, that MAN and Daimler stopped producing high-floor city buses in Europe by 2001 — public (city) transport companies no longer wanted such designs. While the first special bus stop kerbs were using the Kassel Sonderbord, other kerb manufacturers followed the model by offering kerbs that optimize vertical and horizontal alignment for low-floor buses. In 1996, the DIN, the German Institute for Standardization, issued the DIN 18024 part 1 ("Barrierefreies Bauen - Teil 1: Straßen, Plätze, Wege, öffentliche Verkehrs- und Grünanlagen sowie Spielplätze; Planungsgrundlagen" / Barrier-Free Design - Part 1: Streets, Places, Roads and Recreational Areas; Planning Basics), updated in 1998. Kassel had been at the forefront, performing tests with low-floor buses as early as 1992. A simple increment on the bus platform height showed problems with wear on the bus tyres, and the planning department of the Kassel public transport company began to assemble ideas on a "special curb" ("Sonderbord") for their bus stops in 1994. A manufacturer was found in Fröhlich Bau AG in Gesungen south of Kassel with their patent kerb (EP0544202/1993). After its termination manufacturing was taken over by Profilbeton GmbH in Borken, Hesse (also south of Kassel). By 2001 about 16% of bus stops in Kassel had been converted to "Kasseler Sonderbord". The kerb guides the tyre of the stopping bus, improving the alignment of the doors with the kerb and slightly raised boarding platform. As the tyre rides up the concave surface, gravity pulls it back down and steers the bus into alignment. The kerb has become a common part of contemporary bus stop design, and the provisions of DIN 18024-1 were proposed in 2010 to become a section of DIN 18070 („Öffentlicher Verkehrs- und Freiraum“, or Public Transport and Open Spaces). The "Dresdner Combibord" kerb is a parallel development, derived from the elevated sidewalks used for low-floor trams in Dresden, Germany. Its development started during the introduction of the first low-floor trams (mode Gelenktriebwagen NGT6DD during 1995–1998) and the Combibord patent was granted in July 1997 (DE 19730055). The round section allows buses to align to the tram platform in a similar way as the trams for level entry. 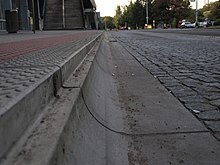 The Erfurt Busbord kerb deployed since 2007 has a height of 240 mm. (the kerb in Kassel has been 180 mm). The Berlin Combibord kerb is 210 mm above rail (the kerb in Dresden is 240 mm above rail). Wikimedia Commons has media related to Kassel kerbs. ^ a b "Bus Stop Innovation: A Comparison of UK Trials". The Centre for Independent Transport Research in London. Archived from the original on 2006-05-12. Retrieved May 9, 2006. ^ a b "Kasseler Verkehrs-Gesellschaft AG: Historie". Archived from the original on 2012-12-02. Retrieved 2012-12-02. ^ "EP0544202: Kerbstone and stop for buses and the like, especially for combined tramway and bus traffic". European Patent Office. ^ a b Dipl.-oec. Jürgen Burmeister (2001). "Einfach einsteigen" (PDF). NahverkehrsPraxis. Retrieved 2012-12-02. ^ "Barrierefrei durch Dresden" (PDF). DVB Fakt. Dresdner Verkehrsbetriebe. p. 4. Retrieved 2012-12-02. ^ "Weitere niederflurgerechte Bushaltestellen". Pressemitteilung. Erfurt Tiefbau- und Verkehrsamt. 2007-10-02. Archived from the original on 2013-02-06. Retrieved 2012-12-02.